My friend Torben took a photo one morning of a tiny frog sitting in the Corsican mint in the path to his front porch. When I saw it, I knew I had to draw it. In the photograph, the reflection of the morning sunlight shone through the translucent toes of the frog’s right front foot, making it glow. I wanted to make that happen with my colored pencils. 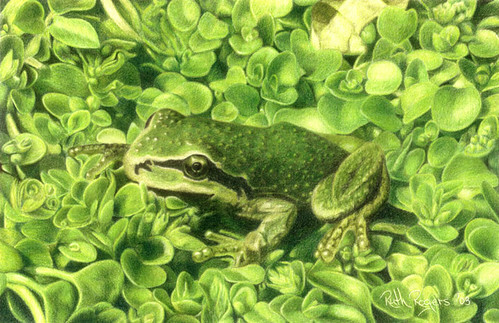 I spent days tediously shaping and shading hundreds of Corsican mint leaves just so I could draw frog toes with sunlight shining through them. And I did. People look at this picture and say “Wow, it looks so real!” Nobody yet has said “Wow, look how his right front toes are glowing in the sunlight!” Most people probably never notice that one tiny detail, but that’s okay. I know it’s there, and it makes me happy.